Business reviews aren’t just a reflection of your products and customer service. They also influence your search rankings, sales and branding. A study by BrightLocal revealed that 85% of consumers read online reviews and 79% trust them as much as getting a personal recommendation from a friend or family member. It sounds silly that someone would trust a complete stranger, but consumers need to know that your business and offerings are worth their hard-earned money. Fortunately, the internet is full of people who can and want to give honest feedback. So, how does this affect your website’s rankings? What do you do if you’re in an unfamiliar city, it’s 4:00 p.m. and you want food? You scroll through restaurant listings and reviews on your phone, right? And you’re most definitely not going to pick the restaurant with 2 stars when you can get dinner from the restaurant with 5 stars for the same price. So it’s safe to say that people favor businesses with better reviews. The search engine’s goal is to provide the user with those reviews or whatever their desired resource is at that moment. Therefore, when someone searches for a local restaurant, Google wants to make sure it’s available. The best way to do that is by looking at customer reviews. We all know that search engines like fresh content. When a customer reviews a business and their offerings, that creates unique, fresh content. That can be great for directories or on the business’ product pages. This can be especially useful for stores that sell other company’s products. For example, Target might use the same description on a product page that the manufacturer used, but the reviews created by customers for that product form unique content that adds value for the reader and the search engines which can increase your rankings. Speaking of value… When someone searches for a business in Google, and that business has reviews, they will get a results page that looks something like the image below. Take a look at the information to the right of the page. Do you see the stars right under LunaMetrics and the pictures? 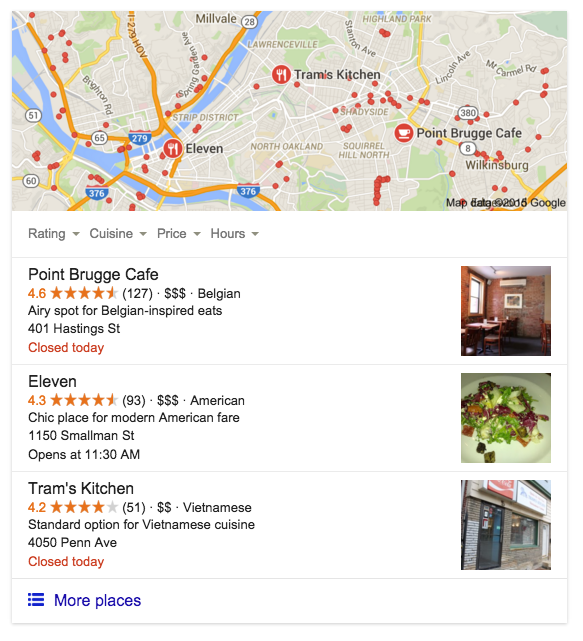 Google prominently displays those reviews for businesses with a Google My Business page so that people searching can quickly determine whether or not they want to learn more about their offerings. 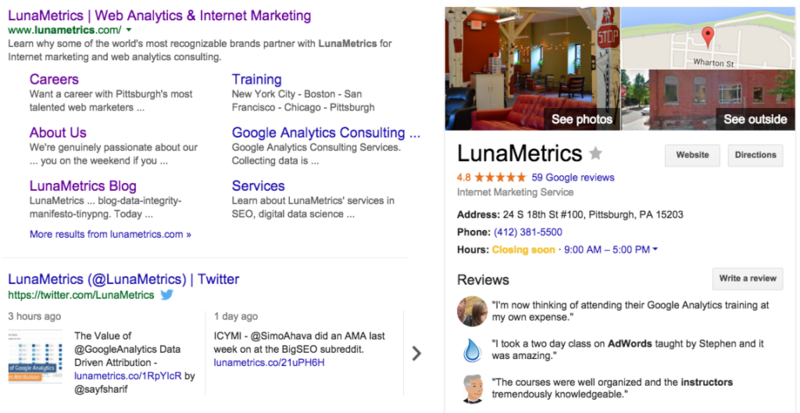 Make a note that the stars in the Google SERPs indicate Google reviews. It isn’t pulling in information From Yelp or any of the other local directories. See that? 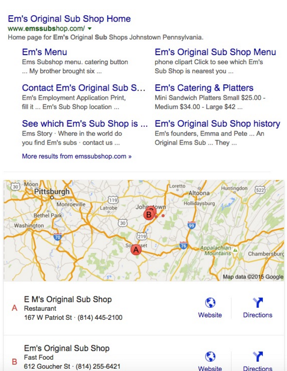 There are no reviews anywhere on the top half of the results for Em’s Sub Shop? This search result isn’t nearly as useful to the users as the one with prominently displayed business information and reviews. By the way, I’m not trying to pick on this restaurant. Em’s Sub Shop is great place in Somerset to grab a bite to eat. The only reason I chose them for this example is because it’s locally owned and is located in a small town, so I had a feeling that they wouldn’t have a Google profile. This is a good example of why small and local businesses need reviews and an even better reason to use Google My Business. 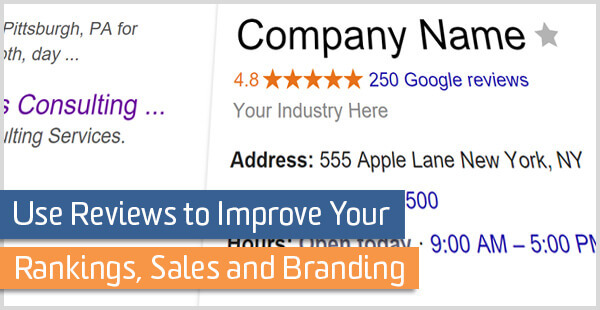 By doing so, you can make sure Google has the right information about your business such as your address, website, store hours, phone number and, of course, ratings. That way, when your potential customers are looking at new restaurants to try, your business and reviews are front and center. Obviously, Google isn’t the only directory you have the option to register a business profile with, but it certainly has its perks. The most recent search market study by ComScore shows that Google sites account for about 64% of the search market share. Look at the chart below. You can see that none of the other search engines even come close. In addition to the most searchers, Google has the local pack, which makes it easier for users to find good, local resources. As long as you have a Google My Business account and your profile is filled out (that means all of your business info, description and photo(s)), you’re eligible to show up in the local pack. Moz did a study showing that the three local results in the pack received 44% of clicks on the first page, so that should give you additional motivation to try to rank there. Did you know that 90% of customers are influenced by online reviews? If your profile doesn’t have reviews, you might be missing out on some sales opportunities. Although businesses with numerous reviews are favorable, not all reviews are created equal. You’ve read the reviews worded something like “Just ordered the [insert product name]. Can’t wait to get it in the mail!” Rated 5 stars. Just, no. This review isn’t helping anyone. Reviews with spelling and grammatical errors can be lumped into the low-quality bucket as well. There’s a professor at atNYU Stern School of Business who studies online reviews. Through his research he discovered that well-written customer reviews improved product sales, even when the reviews were negative. Business owners decided to fix the spelling and grammatical errors in their reviews and, lo and behold, the product demand went up for the products with the corrected reviews. We’ve all seen fake reviews. You can spot them a mile away. Typically, they’re posted within a few hours or a few days of each other and every single one is brimming with product amazement. “This is mind-blowing! I couldn’t imagine my life without [insert product name here]!” Meanwhile, these reviews are talking about a trivial product like a toothbrush stand. When people see reviews like this, they’re immediately wary. They might discard the idea of buying the product altogether. How many sites have customer reviews for your business and how similar are they? When a business has reviews on multiple sites like Yelp, Google Places, Angie’s List, Amazon, Consumer Reports, Trip Advisor, etc. with similar messages, they become more reliable and trustworthy. This gives businesses more incentive to set up multiple profiles. Rankings and sales are important for any business, but the way they impact your branding is also important and is often overlooked. Most people will get upset when they read negative reviews. That’s normal. But, you don’t have to take out your anger on your customer. I want to remind you that reviews are public. Anyone can read them. The way you respond when you get a negative review on a product or service shows users how good your customer service skills are, and that becomes a part of your branding. No one will want to buy from you if you aren’t sympathetic to the customer’s problem. They will associate poor customer service with your business even though it didn’t affect them directly. Companies with good reviews get noticed. If I told you I wanted to buy some outstanding noise-cancelling headphones and asked for your advice, which brands would come to mind? I bet Bose is one of them. Why? Because they have good-quality headphones and people talk about them. When you ask someone a question about a ubiquitous product they’ve had a good experience with, they want to tell you everything they know about it. 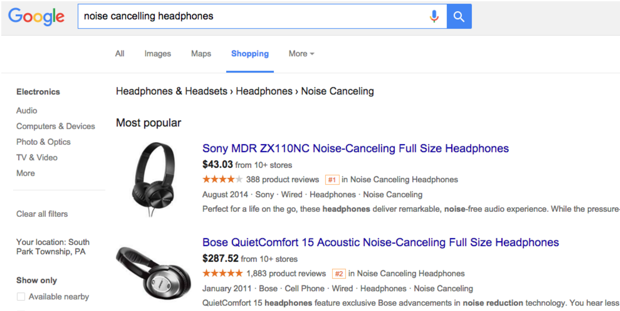 Bose has an average review of 5 stars from 1,883 reviews from over 10 different stores. That’s good enough enough for me.